Table of Contents Next: Fischler, Peter K.
Dimensions 41'2" x 37'11' x 14'4"
Powerplant 1735 hp (1294 kW) Rolls-Royce Griffon IIB 12-cyl inline liquid-cooled engine driving a 13' 3-bladed constant-speed wooden Rotol three bladed propeller. Armament 4 20mm Hispano wing cannon with 160 rounds apiece. External stores 8 60lb (27kg) rockets or two 1000 lb (454kg) bombs. 37 Mk 2 night fighters with more powerful Griffon XII engines and AI radar. 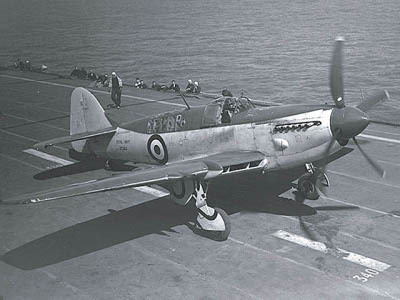 The Fairey Firefly was Britain's best attempt to produce a decent carrier fighter later in the war. Derived from the unsuccessful Fulmar, it inherited the latter's reconnaissance role and two-man crew. Development began in 1940 and the prototype first flew on 22 December 1941. Production began in March 1943. The Firefly saw service in the Indian Ocean and Far East. It was superior to the Zero but was not up to facing the later generation of Japanese aircraft, such as the Tojo, being relatively underpowered and slow. However, it had Youngman flaps that could be used as combat flaps, giving it good maneuverability. It remained in production until 1955 and saw service in Korea.